Before the storm - Do You Speak Gossip?Do You Speak Gossip? These pics were taken about 2 weeks ago, on a really cold day just before the snowstorm hit the town. Even with so much layering I was quite cold, especially on my feet. Yes, I know, I thought the maxi skirt would (partly) protect me from the cold, and I wanted to be comfortable so I went out wearing it. The worst part was when I took my coat off for the pics and I was really exposed to the wind. Thankfully I didn’t catch a cold (I’m a tough one to break! ), but there were some weird old men, looking at us from their car, probably wondering what we were doing, taking pictures in such freezing temperatures. Well, they got the Look back *insert angry-looking face here* and decided to leave us in peace. Local shop long coat (really old), Bershka sweater (black one-underneath), Lussile shirt, vintage ivory sweater, vintage skirt, Zara doctor bag, Zara shoes, Donna Karan sunglasses, H&M necklace, Mango belt, Michael Kors watch. Nail polish: GT Cosmetics no. 357 by Tommy G.
Oh my, I was indeed wearing many items. Sorry for the quality of that one, I had to crop it to show you a better look of the shoes. They are snakeskin snakeskin pumps that I got in Fall, and haven’t worn so many times yet. As I was searching for shoes and bags online the other day, I came across, a beautiful clutch in the exact same colors and pattern, here. I know matching heels and bag isn’t considered a fashionable choice these days, but I say it again and call me old-fashioned or whatever: Nothing beats this classic combination. And classic doesn’t follow trends and therefore, can never be out of style. Outdated maybe, but no matter how many years will pass, no one can say that this combination isn’t stylish. That’s why I love classic pieces. They are the key to every wardrobe. Every woman should have classic pieces that can work, whatever the season, and trends may be. So invest in some key pieces, and add some of the current trends to your outfit. But never buy pieces that “scream the year you bought them”, especially if they are expensive. Trends come and go, and you don’t want to buy something that will be hanging in your closet for many years after, waiting for this exact trend to be back. At least this is what I have in mind when I’m doing my shopping, and it can be a great technique to prevent you from buying something you now love but you won’t wear so many times in reality. Having said that, I’m leaving you with some food for thought. 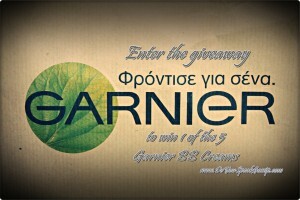 Don’t forget to enter my giveaway to win 1 of the 5 Garnier BB Creams. I thing it’s a marvelous outfit for a day like this! I love the necklace and the shoes!! 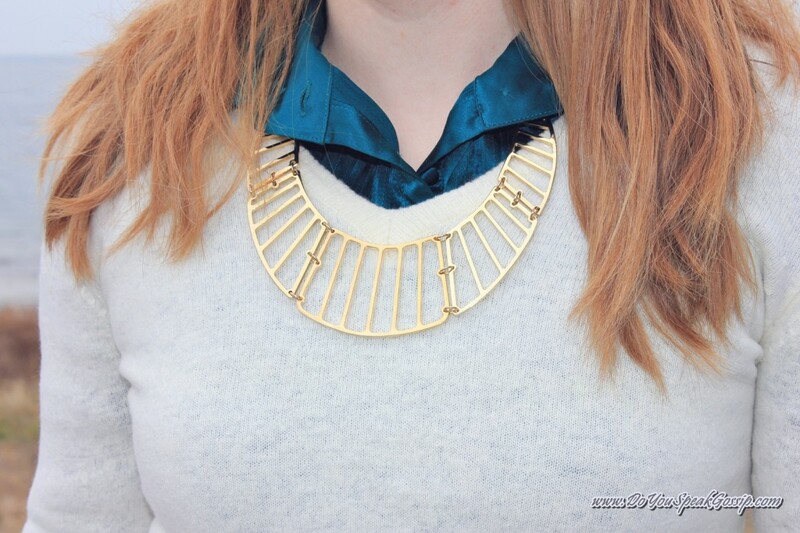 Especially the necklace, I want to buy one like this, I believe it’s so in fashion this winter with a cream blouse or sweater! Thank you very much Dina! 🙂 Glad you liked it! The necklace is from H&M, and I also have it in silver. I bought it for 3euros on sale, it was around 10euros before them. Really?? Very good deal!! Hope I will find it!! Thanks a lot!! Yes, a very good deal indeed! That’s why I bought 2! hehe! You’re welcome! Marianne M. recently posted..Oh la la, Dior! Ontws oi thermokrasies itane ipo tou midenos ekeini ti mera, kai o aeras den voithouse, alla den to skeftomouna ekeini tin wra…Meta apo ligo arxise na me pianei kai ksanaevala to palto mou! Love how you styled this look! The colors and textures are so interesting. Great look,hon!Love the touch of color! BTW, I got your email about GFC being cancelled – I am now following you via bloglovin. Aww thank you soooo much! You’re really sweet! I’m happy you liked my outfit, and thank you so much for following me on Bloglovin’ too. I really appreciate it. Love how you put this together! And the shoes are beautiful! Full of style. Love it! love the jacket, shoes and necklace, stunning! beautiful!!! I really love your blog!!!!! Thank you so much sweety! It’s good to have you back! Believe me, it was really cold! Below-zero temperatures. The next day of the one we took these photos we had a snowstorm in my town. Sometimes it may look sunny (although the sun was hiding behind the clouds) but that doesn’t mean that it is warm outside. In fact it was a quite hazy day. Oh I couldn’t go out in the snow wearing s mini skirt, no way! I’ve seen them too, but there are more appropriate ways to dress when there’s snow outside. Thank you so much for your comment! Have a lovely week! i love winter whites. beautiful maxi coat, too…i can only dream of wearing that here! the shopaholic in me used to buy whatever, whenever. but no i’m more sensible and do try to think each purchase through. Thank you so much! I have this coat for many years, and it’s really warm and comfortable. Although sometimes it’s so cold outside, that I prefer to go out wearing my puffy white coat, from my previous post. I wish we had your weather. I hate winter! I can never feel warm enough. Latrepsa tin tsanta! Einai apisteuti k se ekpliktiki apoxrosi! To palto apisteuto! Genikotera kouklitsa g akomi mia fora! Eχεις πετύχει τέλειο layering! Τα παπούτσια είναι απίθανα! Κρίμα που τελικά δεν τα πήρα και εγώ! Ta papoutsia ta erwteutika molis ta prwtoeida sto internet! Dystyxws teleiwsan edw! Einai pragmati yperoxa mias kai mporoun na apogeiwsoun akoma kai ena aplo ntysimo. Me ena tzin as poume, ena leuko poukamiso kai ena kolie san ayto pou foras edw 8a itan super stylish! Btw, kai i tsanta pou entopises se paromoio sxedio einai poly wraia! Krima! Einai ontws poli wraia kai volika, kai ipirxane kai se kitrino! Alla exei poli kairo pou vgikane opote einai logiko na exantlithikan! I love your coat and belt honey. You look fabulous! So do the pictures. I especially love the second one. eisai poly kompsi kai yperoxos xromatikos syndyasmos, sou paei poly! S’euxaristw poli glikia mou Christina! Xairomai pou sou arese! Einai megalo komplimento otan proerxetai apo ena toso kompso atomo, oso esi! Love the maxi skirt. the accessories you choose for this outfit are beautiful! Pingback: Nature’s child | Outfits | Do You Speak Gossip?